If you're dying to keep using an older Apple Cinema Display with a 2015 MacBook, the Hub+ Mini is your only choice. Ever since the 2015 MacBook shipped, people have been asking me if they could use an existing Apple Cinema Display with it. The answer, til now, has been no. The Apple Cinema Display has an integral cable with power, USB, and mini-DisplayPort or Thunderbolt (with backwards DisplayPort compatibility). 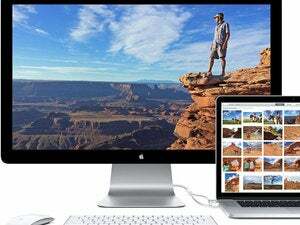 While you can run an HDMI cable to an HDMI or a full-sized DisplayPort input on a monitor, that’s not an option with Apple’s monitors. Now there’s a solution for one very narrow carve out of combinations—given how many emails I’ve received, however, there must be an audience for it. If you have a 2015 (not 2016) MacBook, and you have a DisplayPort version of the Apple Cinema Display (models A1267 and A1316)—not the Thunderbolt version—then the Nonda Hub+ mini fits your needs. If you want to drop $150. For that price, you get a nice little package of brushed aluminum, available in three finishes. It comes with a short, removable USB-C host cable that’s intentionally directional. One end (marked) fits into the dock very neatly and solidly; the other plugs as firmly into the MacBook as Apple’s own charging cable. Many USB-C cables and docks I’ve tested have missed that nice solid slide-in connection. Nonda made a good procurement or manufacturing decision here. We had the correct configuration and tested the 2015 MacBook with the appropriate Apple Cinema Display. With a two-display setup streaming 4K video from YouTube to the Apple Cinema Display, performance went off without a hitch. However, the dock only features USB 2.0 over its two Type-A connectors. That limits data transfer to 480 Mbps or about 35 MBps for hard disk transfer. You can get performance ten times that with USB 3.0 or 3.1. 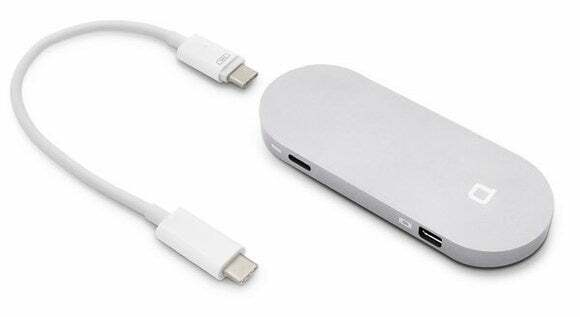 Nonda told us that the chipset that allowed them to work with the DisplayPort version of the Apple Cinema Display wasn’t compatible with the updated version of USB-C in the 2016 MacBook. A more full-featured USB 3.0 hub with three Type-A port and a spare USB-C port plus an SD Card reader is on hold, as well, as they couldn’t find a chipset that met their requirements, either. If you have an investment you want to preserve, this is your only option now, and likely the only option that will ever exist. 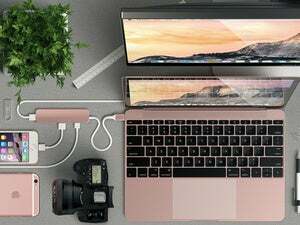 Future docks will support Thunderbolt 3, which uses the same connector as USB-C and will be effectively intercompatible. But no dock yet exists with earlier Thunderbolt support. Instead, other docks typically have an HDMI connector that lets them plug into every other monitor on the market either via a direct HDMI connection or an HDMI-to-DisplayPort cable.